The challenge has been set, and accepted. The Thursday club (mostly grade 6 and 7 kids from Greyton Primary) have, from yesterday, set their sights on the Greyton Classic. Although June is still a long time away and these guys are already rearing to go the time can be well spent honing skills and competitive riding techniques – as we saw from the spills! An event close to home is also a great way to start the season where we hope to get involved in a few more events in the Overberg. There are currently 16 riders with only ten proper mountain bikes. The rest ride on ‘supermarket specials’ or the single speed yellow bikes, and none of them have any riding kit. The Pedalpower Association have kindly donated project funding which will assist with bikes, but we would also like to raise funds to get the kids kitted out with the necessary gear so that the whole club can have a go at top prize! If you’d like to sponsor a helmet, pair of socks, tool kit, branded kit for the club please make a deposit into the Greyton Genadendal MTB club account with reference ‘Thursday’ and your donation will go straight into the pot to get those kids to the races. 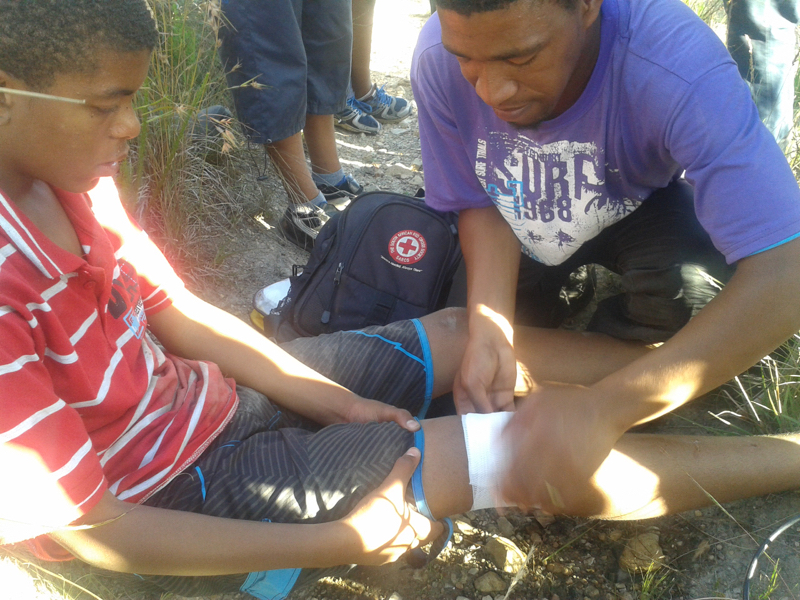 On top of Zig Zag Marshall (a GGMTB Guide)administers first aid.